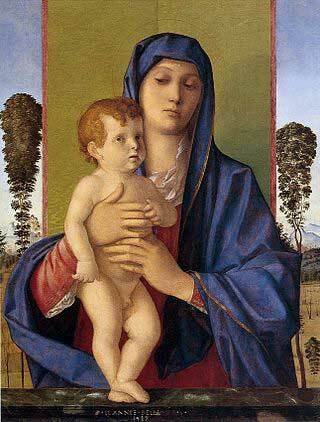 The beauty of many Renaissance Madonnas would be seriously diminished were it not for a certain coloured rock that found its way to Europe from the mountains of Afghanistan. Lapis lazuli is, technically, not a mineral but a rock that contains several minerals within it, including iron pyrites or ‘fools gold’. For artists, however, it’s the crystals of aluminium silicate that create the ethereal blue of lazurite known as Ultramarine blue. Literally ‘beyond the blue sea’ which, from the Venetian perspective, was precisely what it was and the reason it was so highly prized. In 1271, the Venetian explorer Marco Polo, travelling through the Hindu Kush, described mountains ‘in which azure is found; it is the finest in the world and is got in a vein like silver’. Venice was an empire with extensive trade routes stretching east to China. The finest quality lapis from the mines in the Kokcha Valley, Afghanistan, was made into blue pigment and used in masterpieces by Giovanni Bellini and Titian. The colour can be seen today in all the major collections of period work. A few sources of lapis lazuli can be found in other parts of the world, but the quality is generally inferior to that found in the Kokcha Valley region where seams have been mined for at least 6000 years and appear to show no signs of exhaustion. Pigment extraction, however, is not simply a matter of grinding the rock with mortar and pestle. it’s a time consuming and somewhat arduous process as described in the fourteenth century by Cennino Cennini in his book ‘Il libro dell’arte’ (The Craftsman’s Handbook). Watch the video demonstration and spare a thought for all the unknown apprentices whose time and effort has contributed to the beauty of countless works of art.